The knee is a hinge-joint, right? The simple answer is “Yes”, because the knee bends and straightens for walking and running. But the complex answer is “No”, because it also slightly rotates and moves side to side. The knee is stuck between the hip and ankle, both of which allow side-to-side and rotational movements. So rather than purely moving in a single plane for bending-straightening, the knee has the ability to move in other directions to function better and absorb forces. Neutral alignment is when the hip, knee, and ankle are aligned in a straight line, with equal distribution of forces across the joints. The best position for protecting the knee is in a neutral alignment. Knee “valgus” occurs when the knee moves inward, toward the midline of the body, no longer in a straight line between the hip and ankle. The knee is more susceptible to injury when it’s in a valgus position. In fact, many knee injuries, including anterior cruciate ligament (ACL) tears, are highly associated with a knee valgus position. Now that you see the difference between neutral and valgus positions in the knee, it’s important to maintain neutral mechanics through the complete motion of every repetition in your exercise routine. Proper mechanics will help you protect your knees during your training, and will allow you to increase your load without developing overuse injuries. Training with proper mechanics also helps promote better movement patterns that ultimately lead to better performance. So next time you do squats, leg press, stairs, or other standing exercises, make sure you avoid a valgus knee position and focus on maintaining good form. Knee valgus is most obvious when an athlete is landing from a jump, quickly changing directions, or fatigued from physical (or emotional) exertion. Muscles around the hip and core are responsible for maintaining neutral knee mechanics and minimizing valgus. When landing from a jump or changing directions, the torque on the hip is very high, and a great amount of strength is required to prevent valgus at the knee. Knee valgus is evident when athletes land from a jump on both legs, or on a single leg. Note the valgus alignment during shock-absorption (second and fourth images). So if an athlete has even mild underlying strength deficits, or fatigue is setting in, he or she will be more likely to demonstrate knee valgus during landing or cutting in sports, which will make them more susceptible to injury. In sports, sometimes we use valgus mechanics purposefully. In basketball, I’ve seen professional players drop a knee into a valgus position. I’ve seen Olympic sprinters have a valgus angle when they explode off the blocks. And I’ve seen elite alpine skiers allow a slight valgus angle during aggressive turns, as shown in the image below. Note the valgus angle in this elite skier’s downhill leg. 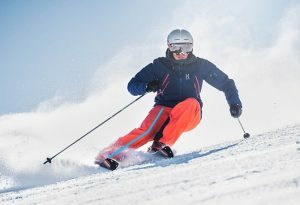 The combination of a straighter knee with a valgus angle is a vulnerable position for the anterior cruciate ligament (ACL), which is a common injury for skiers. The difference between good and bad valgus is the “ability to control” it. When hip and core muscles are strong enough to control the leg and return to neutral despite the demand of the sport, then the athlete will not be AS prone to injury. However, keep in mind that most anterior cruciate ligament (ACL) injuries occur when the knee is straight (rather than bent) and in a valgus position – thus we call this a “Position of Risk”. So, how do you control “valgus” to protect your knees in your sport? Strengthen your hips and core with good technique, and follow a proven sport-specific neuromuscular training program. 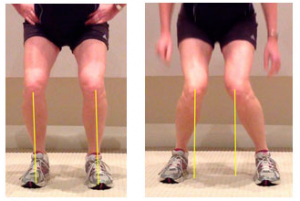 Click here to learn 3 exercises to practice controlling knee valgus. Then head over to ACL Strong to learn how our proven injury prevention training system can help protect your knees.